For the natural things Maldives has to offer, Angaga is lucky indeed. Palms, beach , lagoon, snorkeling and diving are all first class here. Add to this a quiet, laid back atmosphere and you can see why it’s a big hit with the Swiss and German clientele. The one downside is that the interior design and build is not nearly up to the standards of its natural setting. In a time when more and more resort beaches are getting help from groynes and walls, Angaga’s beach still goes all around unobstructed, pure and fine. There is some evidence that the added waterbungalows might change things but it’s not happening yet. 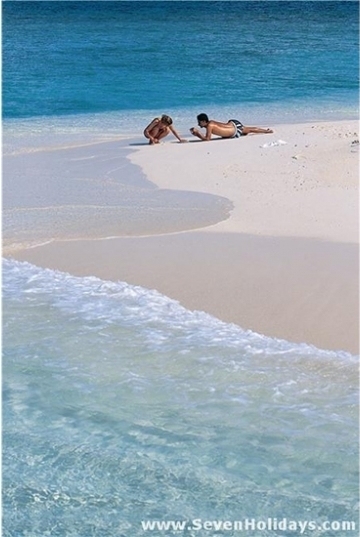 With a soft, sandylagoon on one side and good shade on the other, this is really a beach to savour. Life on Angaga is slow paced and very quiet. There are few evening entertainments and daytime excursions, but most people seem content to break up their day with beach walks, snorkeling, meals and lounging on the veranda. The first dive sets off at 9am, which is most unusual for a Swiss and German island. And the full day trip is from 9 to 4, not 8 to 6, so people can get back to the beach and verandas. That is not to say the dive school is slack. On the contrary, this is a busy, friendly and extremely well run base. 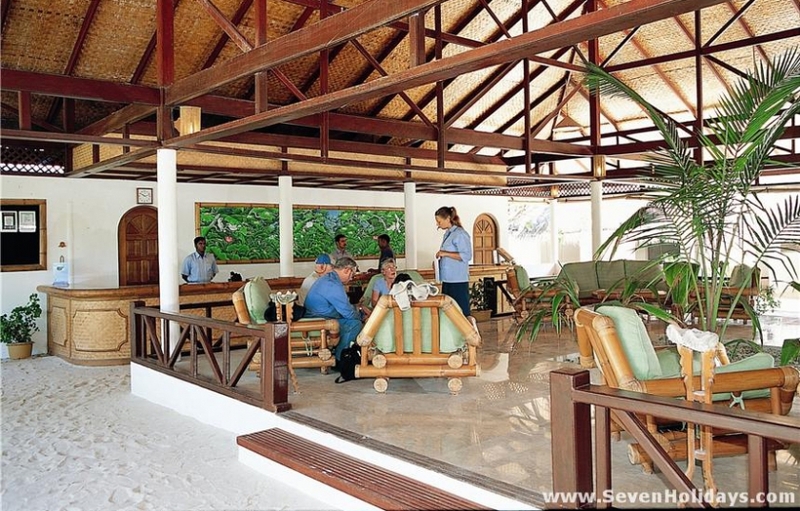 It is not for nothing that it has won ‘The Best Divebase in Maldives’ award from Tauchen magazine. “Every year we have to do a little bit more”, says the base manager Jochen. Having signed up the night before, divers just walk onto the boat come dive time and, with a maximum of 16-18 per boat, there’s plenty of space. Each diver gets a bottle of water and a towel. There’s a fresh water showerhead and, on one of the 2 boats, a sun deck and toilet. 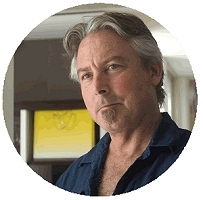 In the high season in particular there’s a high percentage of repeaters, adding to the amicable, family atmosphere. 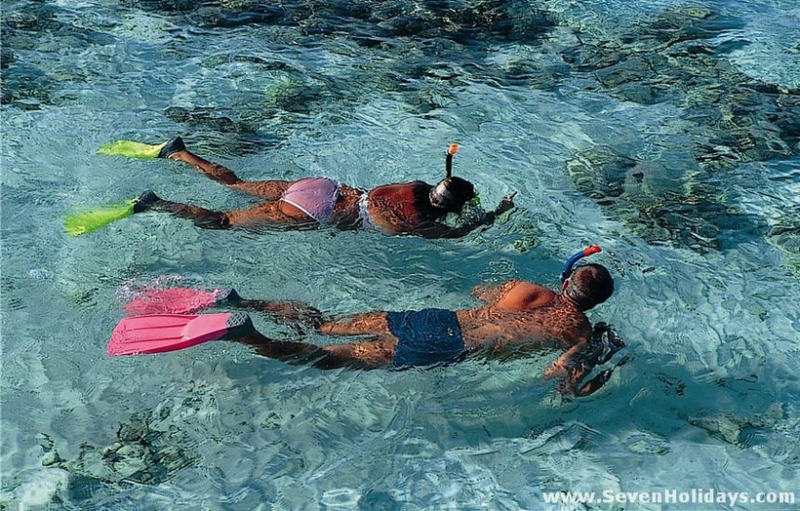 As to the diving , Angaga is within striking distance of all the sites on the east, west and south of South Ari Atoll. To the west is a famous Manta Point, to the east are the channels and thilas and outside the southern islands are the places to sight whale sharks. 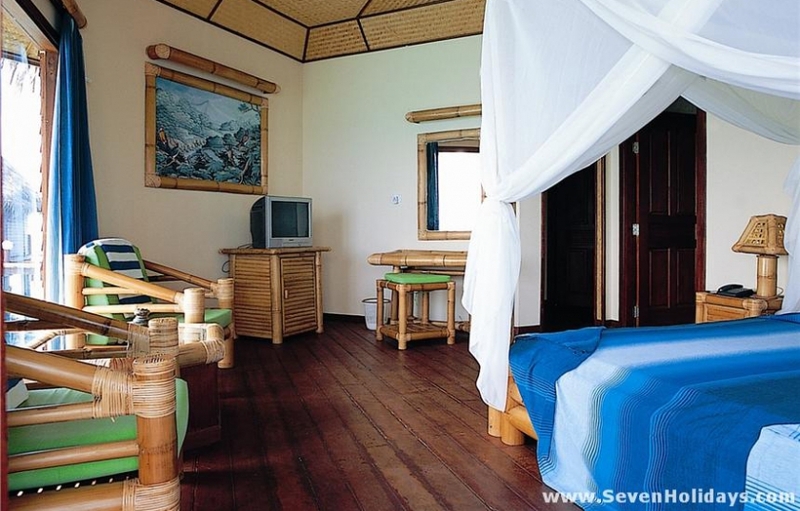 The 50 Beach Bungalows make much use of bamboo and plywood and the main lighting is from fluorescent tubes. The shower is large, though, and the water pressure high. 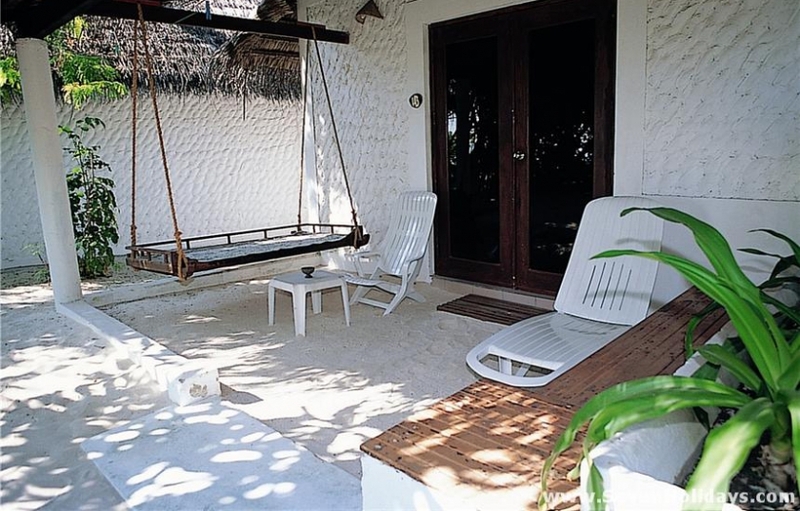 The best part is the cool, dim veranda outside, with its Maldivian swing bed. 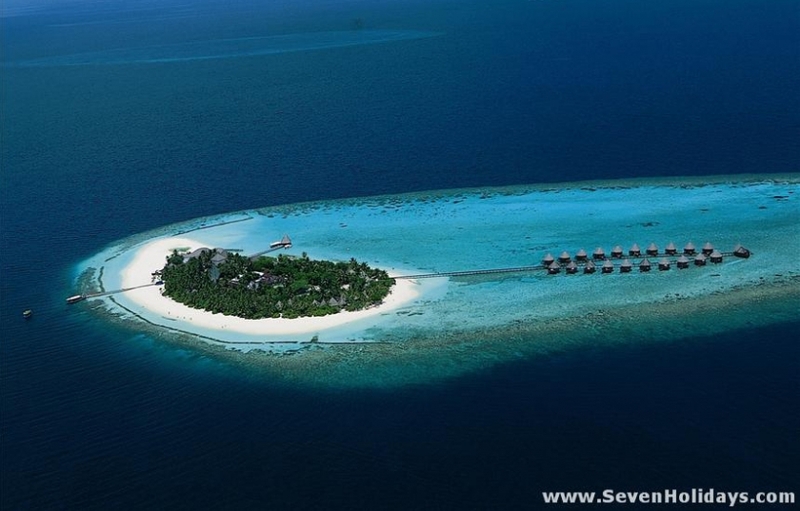 The 20 Water Villas also lack style and quality but they do at least have a lovely sandy-bottomed lagoon for swimming. Those facing northwards don’t catch too much sun on their veranda but the reef is accessible. The others face south for the daytime sun. Another highlight is the dining, especially at night, with candlelit tables and sand underfoot below the arched, thatched roof. The plates are big and so is the buffet selection. Chefs line up to serve and cook at the live stations. The spread is fantastic, but one tip here: it doesn’t change that much so better do only some of it each night. If you’re not put off by style issues or you don’t intend to spend much time indoors anyway, Angaga is really a lovely island - very pretty, very quiet, with a great beach and fine snorkeling.